Guilin City Guide. China Travel Services. CTS. Los Angeles. San Francisco. Guilin is nature's architectural masterpiece in a kaleidoscope of living colors. Experience the magical beauty of limestone rock formations and farmland commonly seen in Chinese landscape paintings. As you cruise along the Li River through misty mountains and lush rice paddies, you’ll understand why the Chinese say: “The landscape of Guilin is unmatched under heaven.” The pleasant climate and the colorful ethnic minority villages only add to the attraction. The Li River Folk Custom Center is a showcase for the folk customs of the indigenous Miao, Yiao, Dong and Zhuang peoples. You can also appreciate the exquisite architecture of the ethnic groups in the recreated dwellings from their villages, whilst enjoying their exotic arts and colorful culture. In Guilin itself, entertainment tends to focus around traditional opera and theater. Visitors to restaurants and hotels are often entertained with opera and ballad singing in a friendly atmosphere. If you prefer a professional performance, try the theatres along Jiefang Xie Lu Rd. You can buy tickets for most shows at the door; the performances generally last for one hour. Located in the center of Guilin, this steep pinnacle offers stunning views over Guilin and the Lijiang River. The summit can be reached by climbing 306 stone steps. This city landmark acquired its name because it resembles an elephant dipping its trunk into the Lijiang River for a drink. It is situated close to the city center with a small park and waterfront promenade where locals exercise and dance. A pagoda was built in the 16th century on top of the hill with impressive views of the river. It is an ideal spot from which to watch the local fishermen with their trained cormorant birds diving for fish as night falls. Lamps on each raft light the way as the cormorants splash about searching for their daily catch. Folded Brocade Hill is one of Guilin's most popular peaks for climbing because of its proximity to the city center in the northeast of Guilin, near the Lijiang River. Many Chinese characters decorate the rocks along the trail leading to the hilltop. From the top you can enjoy the panoramic view of Guilin’s colorful landscape and lush greenery, resembling an intricate brocade fabric. This is a popular hill to climb for a grand view above Guilin and the surrounding countryside. Like many of the limestone peaks in this area, you can find caves like the Returned Pearl Cave. Legend has it that it was once home to a dragon guarding a huge pearl. The pearl was stolen when the dragon fell asleep, but was later returned by the remorseful thief. The hill is also sacred to Buddhists because of the inscribed giant bronze bell flanked by ancient small shrines. On the east bank of the Lijiang River, opposite most of Guilin's main sights, lies Seven Star Park, with seven hills resembling the pattern formed by the Big Dipper constellation. This sprawling park includes a number of huge caves, the most impressive of which is the one-kilometer-long (1,100-yard) Seven Star Cave. The park is also home to the picturesque Flower Bridge, a landscaped bonsai garden and a small zoo. Xi Shan, meaning "West Hill", is a park dwarfed by a set of small peaks surrounding a lake. There were many Buddhist cavern shrines in the park which were destroyed in earlier times, but Xiqinglin Si, the Temple of the Great Buddha, remains more or less intact, with thousands of Buddha statues in various sizes and serene poses. The three-story Guilin Museum is worth a visit, not only for getting the basic background and history of the city, but also for an overview of the culture of Guangxi's indigenous Zhuang minority. A day cruise between Guilin and Yangshuo is the most popular way to see the beautiful scenery along the Li River. Cruises take up to six hours, depending on the water level, and a hot lunch is served onboard. You’ll see farmers tending to their fields beside the river, with the spectacular misty mountain backdrop beyond. In the southern suburb of Guilin lies a small village surrounded by hundreds of unique hills and peaks. The various heights, vertical drops and interesting hill shapes make for an interesting day trip. Xingping is a well-known ancient town with a history of more than 1,300 years, located at the foot of the fertile hills lining the Li River. Some feel Xingping to be the most beautiful spot in the entire Yangshuo area. Daxu Town has a history of 500 years and was one of the most populous towns in southern China during the Ming Dynasty. Traditional brick houses line the stone-slab streets and there is a single-arch bridge built about 400 years ago. Yangdi Village is located among an array of rolling hills. There are many famous sightseeing attractions, such as the Gong-Drum Shoal (Luogutan), White Tiger Hill (Baihushan) and the Yangdi Waterfalls. 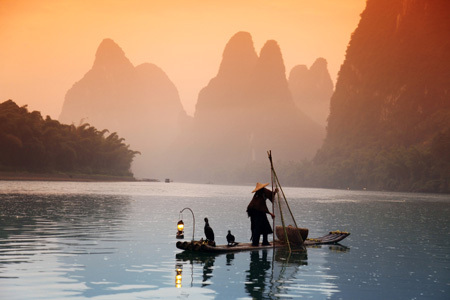 Yangshuo is located some 90 km south of Guilin, and is the disembarkation point after a Li River cruise. It is a small village located in the midst of one of the world's most stunning landscapes. Guilin has many first class and deluxe hotels, but accommodations in Yangshuo tend to be simpler, with many backpacker guesthouses and one 3-star hotel. The best sections of natural scenery along the Li River are near Yangshuo, with bicycle and jogging paths along the river. This popular scenic spot in Yangshuo boasts spiked peaks, colossal caverns and picturesque rural scenery. Famous attractions include the Ancient Ferry, Tunnel Crag (Chuanyan) and Crescent Moon Hill (Yueliangshan). This is a natural attraction about one kilometer away from the banyan tree in the center of Yangshuo. Many people are intrigued by the strange hole (with a diameter of 11 meters) half way up the mountain that resembles a full moon. As you move along to view it from different angles, the moon changes its shape just as the real moon does during its phases. The view from the hilltop is also breathtaking. Fengyu Cave is located in Lipu County, 100km to the south of Guilin. Fengyu Cave, the largest one of its kind in Asia, runs through nine hills and holds not only beautiful stalactites and stalagmites but also an underground river five kilometers long. This is recommended for those looking for someplace a bit different, off the tourist track. In 214 BC (at the same time construction of the Great Wall commenced), Qin Shi Huang, the first emperor of China, ordered the excavation of the Ling Qu Canal. This 34 km canal connected a tributary of the Yangtze River to a tributary of the Pearl River, thereby connecting two of China’s major waterways. The canal made Guilin a major hub for traffic between southern and central China. Ling Qu Canal is the oldest in the world, and one of three major Chinese irrigation projects going back to ancient times. A visit to the canal starts at Xing’an town, 88 km north of Guilin. A three hour drive on winding roads through the countryside brings you to Longsheng County, site of the spectacular Longji Rice Terraces. The terraces, which were carved out centuries ago, cover the hillside to an elevation of 880 meters. The tender green of the young rice shoots and the light reflected in the glistening water creates a beautiful panorama which is popular with photographers. Longsheng County is home to several ethnic minorities, each with their own colorful traditions. Costumes are multi-colored and decorated with many personal adornments. The Zhuang are known for their shoulder pole dance, the Dong for their harmonious folk songs as well as their playful Water-carrying of the Bride, and the Yaos in turn are known for their Long Drum and Long Hair Combing dances. Ziyuan County, 107 km to the north of Guilin, is known for its unique and scenic landscape created by the Karst rock formations. The most picturesque of all is a red sandstone formation which covers about 150 square kilometers. The Octagon Mountain and the Treasure Vessel Waterfall are most impressive. Whitewater enthusiasts will enjoy rafting down the Zijiang River, with 45 shoals and 31 bends it is quite a challenge to navigate. Yuzi Paradise, a public park and sculpture garden surrounded by picturesque mountains, is located in Dabu, approximately halfway between Guilin and Yangshuo. Freedom of expression is encouraged in these natural surroundings, making the park a creative haven for artists from home and abroad. Guilin Rice Noodles is a favorite snack for local residents. Rice noodles, gravy, fried peanuts or soybeans, chopped scallions and thin slides of different kinds of meat are added for various versions of this renowned and tasty dish. Traditional Chinese landscape paintings of the scenic river region are the most popular purchase. Folklore crafts are very colorful souvenirs made by indigenous minorities. The Yangshuo crafts markets is renowned for antiques, with a few shops specializing in ethnic minority handicrafts, such as ethnic jewelry, embroidered textiles, carvings, etc. Guilin Liangjiang International Airport is a fairly modern airport, approximately 28 kilometers from downtown Guilin. There are many daily flights to other cities in China, as well as Hong Kong and Macau, and a limited number of international flights to other cities in Asia. The Guilin Railway Station, located in the south of Guilin, is the hub for rail travel in southern China. It is very busy with two substations, the North Railway Station and the South Railway Station, operating 66 arrivals and departures each day. Guilin is directly linked to Beijing (30 hours), Guangzhou (15 hours), Guiyang (18 hours), Kunming (28 hours), Shanghai (35 hours), and Xi'an (35 hours). You can travel long distances by overland coaches from Guilin to almost every neighboring city in Guangxi and other nearby provinces, or as far away as Hainan Island, Guangzhou and Shenzhen. Construction of new expressways is making the highway network more efficient than ever. You should be aware that not all buses ares air-conditioned and older sections of bumpy roads make it uncomfortable as well as continuous smoking may make the adventure an unpleasant journey. Buses, taxis, pedi-cabs and bicycles are the most popular forms of local transport.